Scripps research scientist Frank Vernon thanks the San Diego County Board of Supervisors for approving investment in HPWREN. 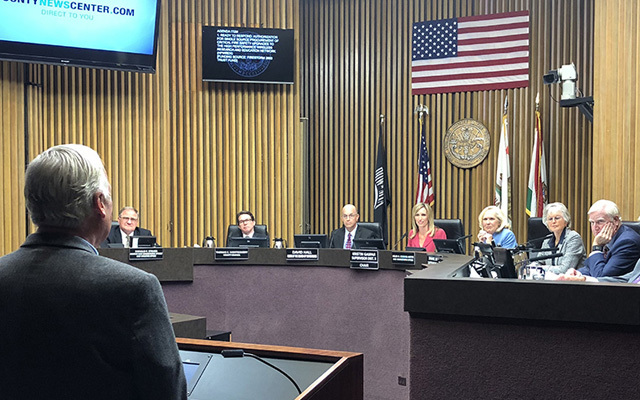 On Jan. 23, the County of San Diego Board of Supervisors voted to approve an investment in technology developed at the University of California San Diego that will improve the County’s fire detection and response capabilities. The County unanimously approved $437,174 to make critical upgrades to the High-Performance Wireless Research and Education Network (HPWREN) and Alert Wildfire network, operated by Scripps Institution of Oceanography and the San Diego Supercomputer Center at UC San Diego. HPWREN and Alert Wildfire connect firefighters with real-time fire activity information across the San Diego County back country. The network of more than 60 fire stations utilizes more than 160 cameras to provide high-quality, on-demand time-lapse HD imagery that helps spot fire outbreaks and prevent them from reaching a catastrophic size. Many of these cameras have live video, time-lapse capabilities, night vision, machine vision to detect smoke, pan-tilt-zoom functions and more. Fire officials have full control of the cameras to monitor fires and triangulate on the location to better respond to fires at their earliest stages. The County of San Diego investment will allow Scripps Oceanography to make critical upgrades to the HPWREN telemetry equipment. The network is a UC San Diego-wide collaboration among Scripps, the San Diego Supercomputer Center, and the California Institute for Telecommunications and Information Technology (Calit2). In 2000, when the network was founded, the HPWREN system used state-of-the-art microwave telemetry of 45 Mbps, but technology has significantly improved in the intervening years. These investments will increase the bandwidth to 220-500 Mbps, providing significantly improved broadband speeds allowing for better coverage of the county and improved internet service connecting 62 remote fire stations in San Diego County. Additionally, five new locations will be added to the network including atop mountains at Sierra Rojo, Cowles Mountain, Cuyamaca, North Peak and White Star. These locations will now receive increased hazard detection coverage with high-resolution, pan-tilt-zoom cameras. This investment by the County of San Diego follows upgrades to the network announced by San Diego Gas & Electric (SDG&E) last November. The 15 high-definition Alert SDG&E Cameras are installed in San Diego’s most fire-prone areas, accessible to fire agencies and the general public at http://www.alertwildfire.org/sdge/. “In an era of more extreme weather conditions, we have a duty to arm the brave firefighters sent to the front lines with the kind of accurate and timely information this technology will provide,” said San Diego County Supervisor Ron Roberts, who along with Chairwoman Kristin Gaspar brought forward this request. The UC San Diego system has proven to be an extremely useful resource during fire emergencies, including the recent Lilac Fire. County staff at the Emergency Operations Center had immediate visibility of the fire from two different Alert Wildfire camera angles within seconds of the fire being reported. Being able to see the fire and its movement patterns can provide the necessary intelligence for fire officials to make quick response decisions.